Lactose is a sugar or disaccharide that is present in all mammal milks: cow, goat, sheep and human, and which is also found in many processed foods. It is the so-called milk sugar (C12, H22, O11), natural disaccharide consisting of glucose and galactose. Lactase is the last enzyme to appear and mature in the baby that is about to be born. It shows maximum activity at the time of birth and during the breastfeeding phase and starts to decline after weaning. 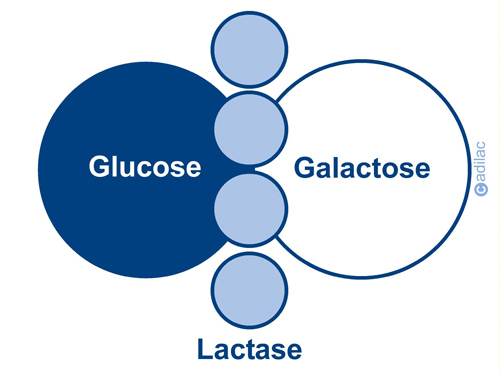 It is the disaccharidase necessary for digestion and unfolding of lactose into two simple sugars, glucose and galactose. Lactase is found in the small intestine and its distribution is irregular. 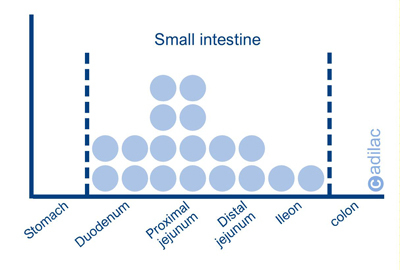 Its activity is maximum if the first portions of the jejunum and non-existent in the stomach and the colon. What direct intestinal symptoms does LI cause? Do all people have the same symptoms? The variability of the symptoms and their intensity will depend on various factors for each individual. · Quantity of lactose ingested. · Simultaneous consumption with other food. · Level of individual lactase activity. · Speed of gastric emptying. · Colon’s capacity for water absorption. Probably the two most important factors for determining the presence of factors are: the quantity of lactose ingested and the colon’s capacity for water absorption in the compensation and rescue of carbohydrates, re-absorbing water and fatty acids from the short chain. What other unspecific symptoms may occur? In some individuals there may be a series of symptoms called systemic symptoms (beyond the intestinal area) due to the production of toxic metabolites such as acetaldehyde, ethanol, peptides, etc. :· Headache. Which races are most affected? 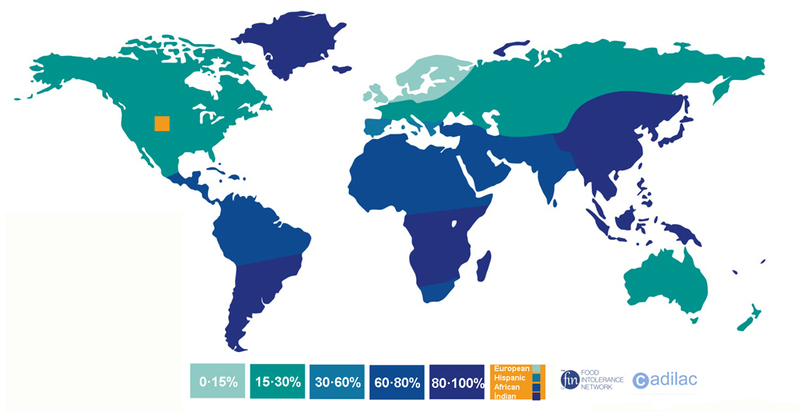 70% of the adult global population has primary lactase deficiency, except for towns in the north of Europe. Centuries ago, these towns, far from the sea, with little access to sunlight, severe climates and difficulties for agriculture, found in dairy consumption a means of survival and became “farmers”. This fact provoked a genetic mutation that allowed them not to stop producing lactase and to be lactose-persistent. What types of lactase deficiency exist? The reduced production of lactase is secondary, as it is caused by another motive or enteropathy. 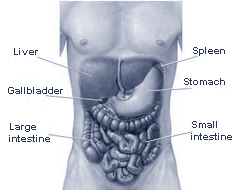 Once the person is cured and when the intestinal mucosa has regenerated, the poor digestion disappears. · Premature babies present a congenital lactase deficiency because the lactase is mainly developed in the third trimester of pregnancy. The baby is born with lower lactase activity than that needed and presents problems of poor digestion of the maternal colostrum. This is a transitory situation, with few symptoms, which corrects itself spontaneously. · Viral infectious gastroenterocolitis. · Parasite infectious gastroenterocolitis. · Coeliac illness. · Crohn’s disease. · Malnutrition due to prolonged diarrhoea. · Malnutrition due to anorexia or bulimia. This is an unusual form of deficiency, where the newborn presents symptoms with the first exposure to maternal milk. It is caused by a genetic defect caused by autosomal recessive mutation of the LCT gene that codes the lactase, causing null or minimum enzyme activity. Very few cases have been detected in the world (40), with the majority being in Finland (16). It is essential to prescribe a lactose-free diet for the nursing infant in order to avoid injury and serious complications in their development. Can lactose intolerance be considered a recent occurrence? No. The genetic analysis of remains from the first populations that began to settle and farm, in the Neolithic era (8000 BC) suffered from primary lactase deficiency or LNP. Hippocrates, considered to be the father of modern dietetics and medicine, described back in 400 BC a series of intestinal symptoms in some people after consuming dairy products such as milk and cheese. However, it was in 1950, when the consumption of dairy was becoming generalised on a global scale, that the first documented medical cases of lactose intolerance appeared. Are lactose digestion problems the same for everyone? No. In this primary deficiency of lactase, no two people are the same. As we explain in greater detail in the section What is LI? each person has their own threshold of sensitivity and although we are all people with poor digestion of lactose, there are people who can digest certain quantities of lactose without symptoms (up to 12g in a single dose accompanied by other food), and others than with less than 6g present symptoms of lactose intolerance. Why is it important to detect and treat it quickly? Lactase is one of the most delicate and vulnerable intestinal enzymes. If we continue to ingest lactose, the injury to the intestinal mucosa will grow and a vicious cycle will begin: Injury to mucosa/poor digestion of lactose which will be increasingly difficult to resolve. Is lactose intolerance different to allergy to cow’s milk protein or CMP? Although both ailments have the same origin (milk or dairy), they have nothing in common (allergy to CMP is a reaction of the immune system to milk protein). This explains why on the market you can find products that are suitable for the lactose intolerant (lactose-free milk, cheese, etc.) that are not suitable for those allergic to CMP. How to live with intolerance? The lack of milk in the diet can cause significant mineral needs (calcium, phosphorous, potassium, magnesium, zinc and iron), fat-soluble vitamins (A, D, E, K) and water-soluble (B1, B2, B6, B9, B12 and C). The most common complications can be loss of weight and malnutrition. Therefore, it is essential to consume other products rich in these substances, which fortunately are easy to find. · Calcium: Fish, spinach, almonds. · Phosphorous: Walnuts, sardines, eggs. · Potassium: Bananas, chicken, avocado. · D: Organism through sunshine, cod liver. · E: Vegetable oils, nuts. · K: Tomato, celery, blackberry. Are fermented dairy products better tolerated? 1. In the fermentation process, the lactic ferments (bacteria such as Lactobacillus bulgaricus and Streptococcus thermophilus) hydrolyse the lactose, producing lactic acid and reducing their presence. 2. In the case of yoghurt, the lactic ferments (alive in the final product) continue consuming the lactose present in the final product after being ingested, thus facilitating the digestion of the lactose present in the yoghurt for people who are lactose intolerant. 3. The consistency or viscosity of this type of product slows down its digestion, delaying gastric emptying and modulating intestinal motility, causing the lactose to be released more slowly in the duodenum and to be maintained in the small intestine for longer. This slowing down will cause the lactose to be present for longer in the intestine in contact with residual lactase, optimising its action. If I don't want to reject dairy, what are my alternatives? If you don’t want to reject the taste and nutritional properties of cow’s milk, in recent years there has been availability of milk brands on the market where the lactose has been eliminated or previously partially hydrolysed called ‘low in lactose’ or totally hydrolysed called ‘lactose-free’. This range has been complemented with dairy-derived products such as different varieties of cheese (gouda, emmental, etc. ), yoghurt, flavoured milkshakes, cream etc. You can also find lactase supplements in the pharmacy in the form of tablets/capsules/drops that will allow you to consume dairy products. These are recommended for sporadic use if eating outside the home and you’re not sure whether the dishes contain lactose or not, when attending a business dinner, a celebration etc. These tablets provide the organism with the lactase that we need to break down the lactose in a specific meal, so you should take it each time you eat because the effect is momentary. The main issue is finding the right dose, as this will always depend on various factors (question 4) but particularly on the relationship between your level of intestinal lactase and the amount of lactose ingested. Can it be considered to be an illness? Taking into consideration that approximately 2/3 of the global population, i.e. the majority, suffers from this deficiency, we cannot consider it to be an illness, but rather an inability to digest milk sugar. What is milk and what isn't? The definition of milk is ‘the secretion from female mammals with the purpose of satisfying the nutritional requirements of the newborn during their first years of life’. In the regulations of our country, ‘milk’ can only be used to refer to ‘cow’s milk’. To refer to milk from other animals, the name of the species must be specifically designated: ‘sheep milk’, ‘goat milk’, ‘buffalo milk’, ‘maternal milk’. Plant-based drinks (soy, rice, hazelnut, oat, tiger nut, etc.) can never be advertised as milk, only as plant-based drinks. With the exception of ‘almond milk’ due to its traditional and historic denomination in our country. In other countries such as France, this is true for ‘coconut milk’. · Addition of vitamins and minerals. Any other treatment will not permit the denomination of ‘milk’ and must be called ‘dairy product’ or ‘dairy drink’. How much lactose is there in milk? How are lactose-free products prepared? 1. Hydrolysis of lactose through the addition of lactase (A type of microbial B-galactosidase derived from micro-organisms such as Kluyveromyces lactis, Kluyveromyces fragilis or, to a lesser extent, Aspergillus oryzae). If this method is used, it can be called milk. 2. Partial elimination of lactose through physical methods such as ultrafiltration or chromatography. This method is normally used in combination with hydrolysis. If this method is used, it cannot be called milk. Why is lactose-free milk sweeter? 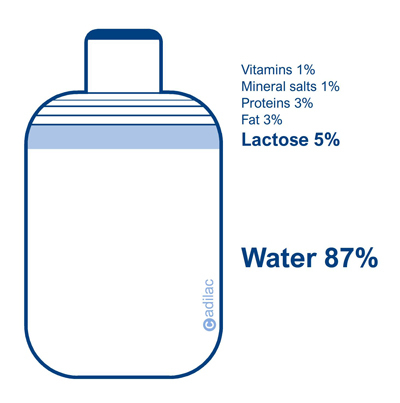 Lactose-free milk (when it is prepared through hydrolysis) is sweeter than ordinary milk because during the hydrolysis process the lactose is broken down into two simple sugars (glucose and galactose) that together are sweeter (87) than lactose itself (22). 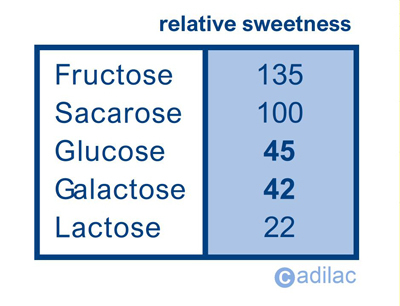 On the table is a comparison of the relative sweetness of different sugars compared with the 100% value of sacarose (ordinary white sugar). If the lactose-free milk has been prepared through physical means where part of the lactose is eliminated through physical means, the milk will be practically just as sweet.